Stop in at Town Hall on South West Avenue opposite the Post Office. REMEMBER: All trails are designed for foot traffic only! The surfaces, curves, widths, and overhead clearances cannot accommodate wheeled vehicles safely. In addition, motorized vehicles are illegal on the trails and throughout the Conservation Lands. If you witness motorized vehicle activity on the trails, please notify the police immediately. These wooden posts are located at major entry points and junctions throughout the trail system. This map shows only the major trails; access trails are not shown. If you're curious about lengths of particular trails, see our Trail Inventory documents. Wenonah Lake Trail is now a loop trail around the entire lake. 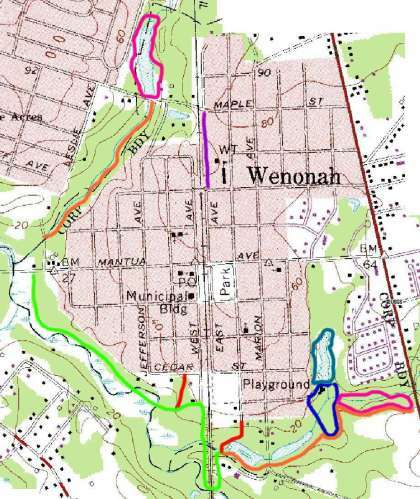 Wenonah School Trail, Dilk's Pond Trail, and Synnott's Pond Trail have been created. The South Clinton Street Extension is now called the Garden Trail. 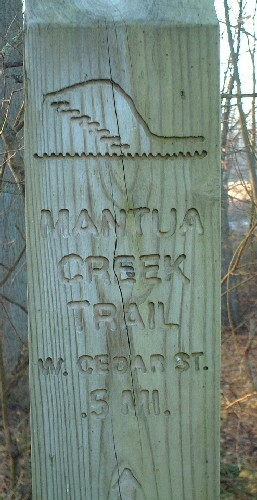 The Mantua Creek Trail extends continuously from Mantua Avenue southeasterly to the railroad trestle, and then northward to a junction point near the Bog Walk. The Glen Trail extends only from 100 West Cedar Street to the intersection with the Mantua Creek Trail. The Monongahela Brook Trail extends from the Bog Walk eastward to Woodbury-Glassboro Road, overlapping parts of the Eldridge Loop and Monongahela Brook Loop.